The Sukhoi Su-47 Berkut (Russian: Су-47 Беркут - Golden Eagle) (NATO reporting name Firkin), also designated S-32 and S-37 (not to be confused with Su-37) during initial development, is an experimental supersonic jet fighter developed by Sukhoi Aviation Corporation. A distinguishing feature of the aircraft is its forward-swept wing, similar to that of the Tsybin's LL-3.. The sole aircraft produced is an advanced technology demonstrator prototype and manufacture of a planned second flying prototype is under question due to recent MiG developments of 5th generation Jet fighters. This aircraft is sometimes confused with the single-engined delta canard design offered by Sukhoi in the early 1990s under the S-37 designation. Originally known as the S-37, Sukhoi redesignated its advanced test aircraft as the Su-47 in 2002. Officially nicknamed Berkut (Golden Eagle), the Su-47 was originally built as Russia's principal testbed for composite materials and sophisticated fly-by-wire control systems. TsAGI has long been aware of the advantages of forward-swept wings, with research including the development of the Tsibin LL and study of the captured Junkers Ju 287 in the 1940s. Forward-swept wings yield a higher maximum lift coefficient, reduced bending moments, and delayed stall when compared to more traditional wing shapes. At high angles of attack, the wing tips remain unstalled allowing the aircraft to retain aileron control. Conversely, forward sweep geometrically creates increased angle of incidence of the outer wing sections when the wing bends under load. This creates more lift, more load, more angle of incidence, etc. This leads to a tendency to for the wings to fail structurally at lower speeds than for a straight or aft-swept wing. Forward swept wings counter this by being designed to twist downward as they bend upward. This twisting-as-it-bends is done with composite materials on the S-37, but it can also be done with conventional materials. The project was launched in 1983 on order from the Soviet Air Force. But when the USSR dissolved, funding was frozen and development continued only through funding by Sukhoi. Like its US counterpart, the Grumman X-29, the Su-47 is primarily a technology demonstrator for future Russian fighters. However, Sukhoi is now attempting to market the Su-47 to the Russian military and foreign customers as a production fighter in its own right. The Su-47 is of similar dimensions to previous large Sukhoi fighters, such as the Su-35. To reduce development costs, the Su-47 borrowed the forward fuselage, vertical tails, and landing gear of the Su-27 family. Nonetheless, the aircraft includes reduced radar signature features (including radar absorbent materials), an internal weapons bay, and space set aside for an advanced radar. Though similar in overall concept to the American X-29 research aircraft of the 1980s, the Su-47 is about twice the size and far closer to an actual combat aircraft than the US design. To solve the problem of wing-twisting, the Su-47 makes use of composite materials carefully tailored to resist twisting while still allowing the wing to bend for improved aerodynamic behavior. Due to its comparatively large wingspan the Su-47 is to be equipped with folding wings in order to fit inside Russian hangars. Like its immediate predecessor, the Su-37, the Su-47 is of tandem-triple layout, with canards ahead of wings and tailplanes. Interestingly, the Su-47 has two tailbooms of unequal length outboard of the exhaust nozzles. The shorter boom, on the left-hand side, houses rear-facing radar, while the longer boom houses a brake parachute. The Su-47 has extremely high agility at subsonic speeds, enabling the aircraft to alter its angle of attack and its flight path very quickly while retaining maneuverability in supersonic flight. 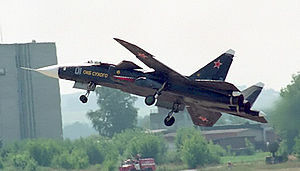 The Su-47 has a maximum speed of Mach 1.6 at high altitudes and a 9g capability. Maximum turn rates, and the upper and lower limits on airspeed for weapon launch, are important criteria in terms of combat superiority. The Su-47 aircraft has very high levels of maneuverability with maintained stability and controllability at extreme angles of attack. Maximum turn rates are important in close combat and also at medium and long range, when the mission may involve engaging consecutive targets in different sectors of the airspace. A high turn rate of the Su-47 allows the pilot to turn the fighter aircraft quickly towards the next target to initiate the weapon launch. Like most other fighters with fly by wire controls, the Su-47 achieves some of its high maneuverability through relaxed stability. The Su-47s fuselage is oval in cross section and the airframe is constructed mainly of aluminium and titanium alloys and 13% (by weight) of composite materials. The nose radome is slightly flattened at the fore section, and has a horizontal edge to optimise the aircraft's anti-spin characteristics. The forward-swept midwing gives the unconventional (and characteristic) appearance of the Su-47, earning it the nickname of 'devil' and 'slingshot'. A substantial part of the lift generated by the forward-swept wing occurs at the inner portion of the wingspan. The lift is not restricted by wingtip stall. The ailerons - the wing's control surfaces - remain effective at the highest angles of attack, and controllability of the aircraft is retained even in the event of airflow separating from the remainder of the wings' surface. The wing panels are constructed of nearly 90% composites. The forward-swept midwing has a high aspect ratio, which contributes to long-range performance. The leading-edge root extensions blend smoothly to the wing panels, which are fitted with deflectable slats on the leading edge; flaps and ailerons on the trailing edge. The all-moving and small-area trapezoidal canards are connected to the leading-edge root extensions. A downside of such a forward-swept wing design is that it geometrically produces wing twisting as it bends under load, resulting in greater stress on the wing than for a similar straight or aft-swept wing. This requires the wing be designed to twist as it bends - opposite to the geometric twisting. This is done by the use of composites wing skins layed-up to twist. Despite this, the plane was initially limited to Mach 1.6. Recent engineering modifications have raised this limit, but the new limit has not been specified. The thrust vectoring (with PFU engine modification) of �20� at 30�/second in pitch and yaw will greatly support the agility gained by other aspects of the design. The cockpit's design has focused on maintaining a high degree of comfort for the pilot and also on the pilot being able to control the aircraft in extremely high g-load maneuvers. The aircraft is equipped with a new ejection seat and life support system. The variable geometry adaptive ejection seat is inclined at an angle of 60�, which reduces the impact of high g forces on the pilot. The seat allows dogfight and missile avoidance maneuvers with significantly higher g loadings than can normally be tolerable. The Su-47 pilot uses a side-mounted, low-travel control stick and a tensiometric throttle control. Pilots, however, claim that the cockpit gives them low visibility due to poor design. This reclined seating arrangement was first used in the American F-16. Tayor, Michael J. H. (1999). World Aircraft & Systems Directory. Herndon, VA: Brassey's. pp. 78-79.